Hey, we are still alive. More or less, at least, since we're both approaching the end of our studies - finishing a thesis is a lot of work! Sorry for keeping you wait this long, but we're back with good news! Let us take a look at what happened during the past six months on the homepage and serverside with this post. The biggest news is the complete redesign of the homepage. Since the old design was a little rusty we decided to go with a design that feels lighter and has more space for content. Take a look! Game entry page on redesigned homepage. 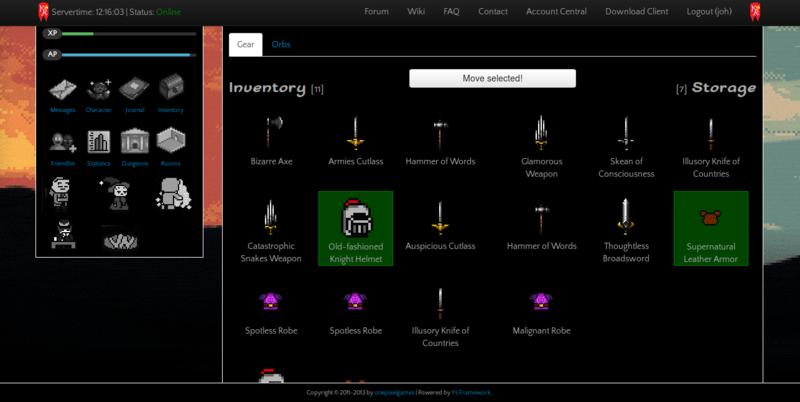 On the left you now have an all time visible Infobox showing your Level, faction, experience, money and activity level. If you have been cursed by Konyak, active curses will also be displayed here. Below this information you can find the usual links leading to your rooms and dungeons, as well as to your character, your friendlist and statistics. We want to add quests to the game, but we're unsure whether this will make it into the next playable version of the game. Not only did we rework the homepage itself, but also most of the subpages. Below you can see the inventory screen, which shows the gear your hero carries into the dungeons with him, as well as the storage for all your gear you don't want to carry with you. The inventory now feels much smoother, since it makes extensive use of AJAX technology where your browser doesn't need to reload the page. This goes for all of the redesign and additions we've made. Most of it was about a better user experience that makes the homepage feel a lot smoother and less bulky. New inventory for managing your characters gear. But what about the two most important tools of the game? 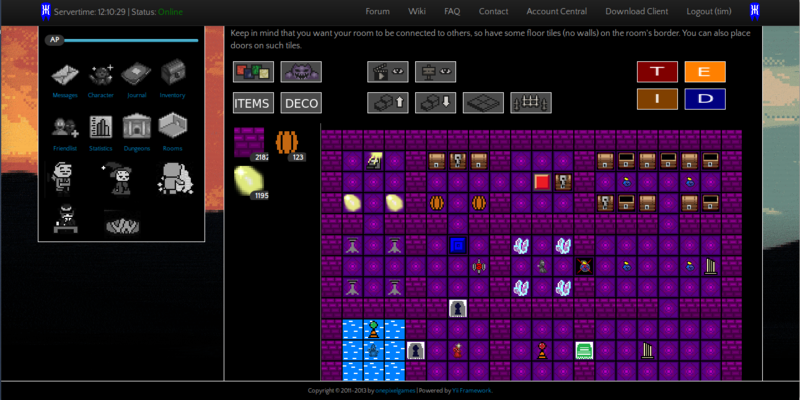 The dungeon editor and the roomeditor have been greatly reworked, too. While the dungeon editor had only slight adjustments, as its usability was already very good, the room editor underwent a complete redesign. A lot of new features were added (like signs and heights) and had to be covered during the editor rework. 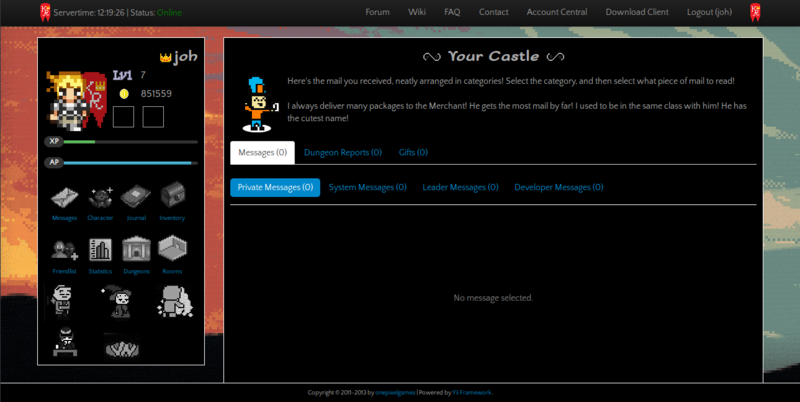 The interface now looks a little more complex, but it really feels nice while using. The roomeditor now also uses AJAX and does not have to reload all the time - yay! Yeah, we still need to replace the button graphics at the top right. Let's talk about the new marketplace. Well, it looks a whole lot better now and it's way more fun to go shopping on a nice sunny saturday (or any other day, really). 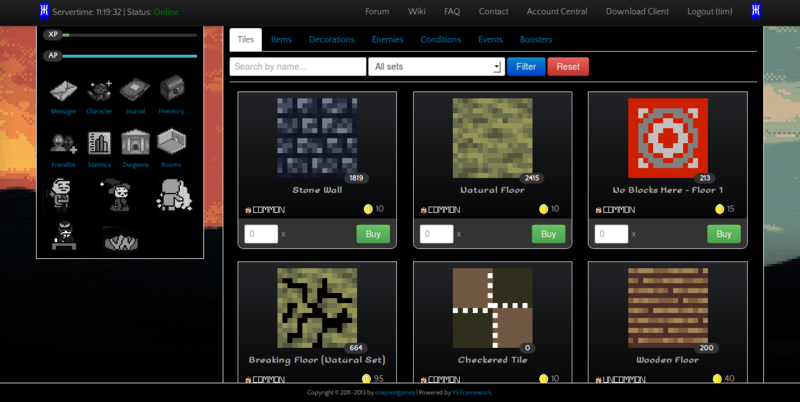 You can now search by name, and we have organized tiles into sets as well. Marketplace shows huge tiles with the sold items. Did you notice the little crown next to the playername in the infobox on the left in all of the screenshots? Yeah, you guessed right, it's an image of King Red's crown which just leads us to the commercial part of the game. For the covering of server costs and maintenance we decided to go on a premium subscription model for our game. You will be able to purchase passes that grant you "premium" rights for a certain amount of time. This includes higher level and money caps, more inventory slots, more slots on your friendlist, more curses or contracts with (the scary) Sr Cosca (oh you will meet him! ), and a few more surprises. But don't worry, you'll still be able to play the game without paying! Alright, that about covers it for the new homepage! Once again, we're sorry that it's taking us so long - but hey, we just want to make sure it's as good as possible! Feedback is, as always, much appreciated! As always, any feedback or comments you have are much appreciated! We look forward to them!